A small, but important part of the world ocean – Black Sea, borders six countries: Bulgaria, Russia, Romania, Ukraine, Turkey and Georgia. Total population of those countries is about 165 million people. During its history of millions of years, the Black Sea has sometimes been a lake and sometimes a sea. 250-40 million years ago, it was at the edge of Tetis that connected the present Atlantic and Pacific Oceans. In the area of the present Black, Caspian and Aral Seas a landlocked freshwater Sarmat sea-lake was formed. It has existed for 2-5 million years, and during this period a freshwater flora and fauna has developed, remains of which can be tracked up to date. The shape of the Black Sea is changing: slowly, but firmly taking up its coast. The increase of the Black Sea level compared to its coastal marks has been tracked as long as ongoing scientific observations have been made. The ecosystem of the Black Sea has been closed for many thousands of years and slightly opened just six thousand years ago. This ecosystem is still far from being in equilibrium and is very vulnerable to the external factors. That is why the changes of the biological structure of the Black Sea still take place (5). There are some ways for pollutants to enter the sea. 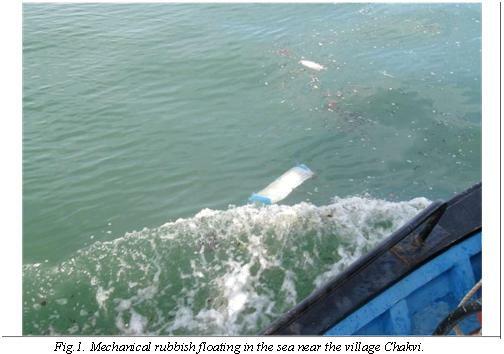 One such pollutant is sewage that is discharged into the sea after being treated. The liquid waste from the industrial plants is also discharged into the sea. The most significant pollution of the sea is one in which atypical chemicals, such as gaseous and aerosol pollutants, come from the industries and households. The amount of carbonic acid in the air is increasing as well. Further development of this process may result in the unfavorable tendency of increasing the average sea level in the region. The general condition of the territory of Georgia is determined by the following: geo-chemical, hydro-chemical and bio-chemical pollutions caused by technogenic waste, as well as natural radiation sources and radioactive pollution from environmental technogenic sources. 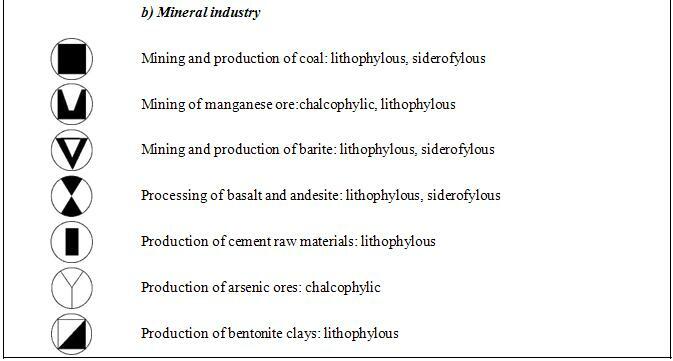 The main causes of geo-chemical, hydro-chemical and bio-chemical pollution in the West Georgia are mining, industrial (Chiatura, Kvaisa, Tkibuli, Tkvarcheli, Tsana, etc), metallurgical (Zestaponi), oil refining (Batumi) and oil bottling (Supsa) activities. In addition, pipelines (Baku-Supsa and Baku-Jeikhan) and natural gas pipelines (Vladikavkaz-Tbilisi-Erevan, Baku-Erzerum) could be serious factors for pollution. Our Analysis of materials showed that in terms of geo-chemical, hydro-chemical and bio-chemical pollution, the area of Uravi mining industrial complex (currently abandoned; Racha district) is particularly significant as considerably high level of pollution in this area is alarming. However, the ecological conditions of territories around Chiatura and Zestaponi mining-metallurgical industries were shown to be relatively stable. As elsewhere in the world, there are heavy and toxic elements in the soil in Colchian lowland and Rioni river basin area (West Georgia) cities and smaller populated areas as well. These elements are not only hazardous for biocoenosis (plants, animals and living microbes) but for humans. The study showed that most geo-chemical pollution is found in industrial cities. This is illustrated in the table 1. As the scientists point out, on the basis of hydro-geological and hydro-chemical information, there are three ecological water types on the territory of the West Georgia: well maintained, poorly maintained and unmaintained. The first group includes the Great Caucasus and the Southern slope ground waters; the second group includes the karst and volcanic rock waters of the Lesser Caucasus; and the third group includes intermountain waters, connected with friable quaternary sediments. Since intermountain areas are characterized by more intense agricultural activity, these waters are polluted by toxic elements. Bacterial pollution, which is characteristic for the western part of Georgian rivers and the Black Sea coast, is most significant in areas where water supplies used by factories are directly dumped into the rivers and sea. The ecology of the Black Sea cost drew a great deal of attention. Following an international index, there are three zones of Georgian waters: normal waters, with an index of 0, 75 – 1, 25; polluted waters with an index from 1, 25 to 1, 75; and severely polluted waters, with an index of 1, 75 to 3, 0. The first zone is deeper in the sea, closer to the neutral waters. The second zone covers almost the entire coast of the Black Sea. The third zone is located in Batumi and Poti seawater areas where there as intensive shipping activity. However, the researchers make it clear that one of the causes of the geo-ecological imbalance is natural geo-dynamic activity, which includes floods, avalanches, landslides, and other similar processes. 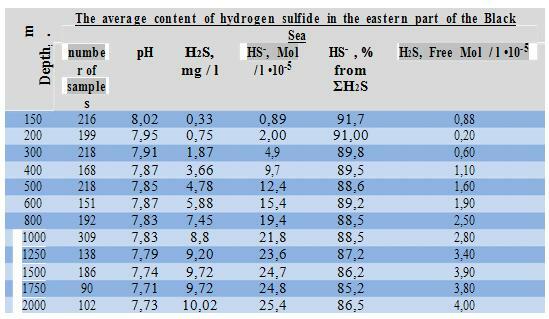 After analyzing all the geo-environmental data of the coastal strip of the Black Sea, we can say that the natural marine pollution occurs by hydrogen sulfide and methane (Table 2). Sea water pollution is also caused by other anthropogenic activities. 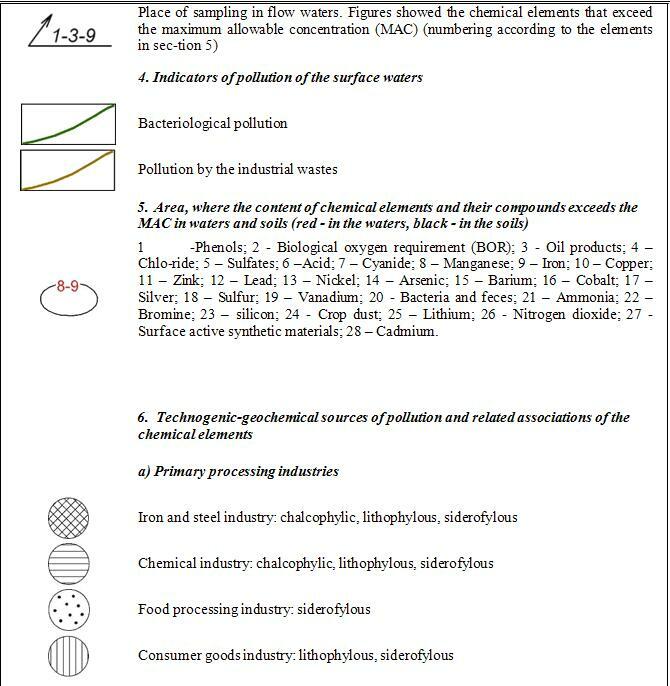 The extent of contamination is usually dependent on the intensity of industrial processes (pollution of river waters and the coastal strip of the sea, marine pollution with household waste (Fig.1), bacterial contamination, etc. As a result of our studies, in marine and river sediments there are observed arsenic (As) and cadmium (cd) at high concentrations (Fig. 2.A). 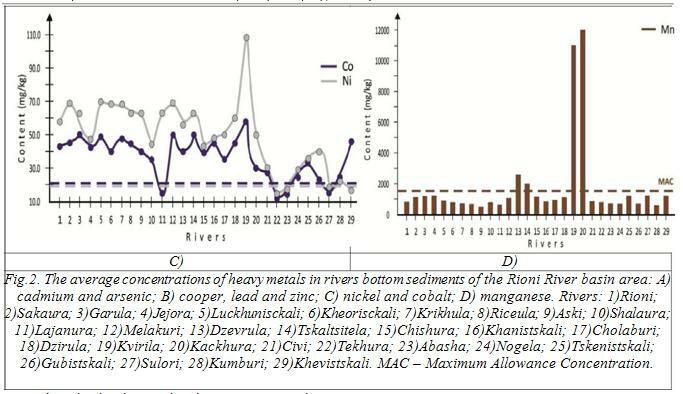 Also noteworthy is the quantities of zinc (Zn), lead (Pb), nickel (Ni) and cobalt (Co) and its high concentrations (compared to Standard (1)) in river bottom sediments of Rioni River basin area (Fig. 2.B: 2.C.). Among the heavy metals in river sediments relative stability preserves copper (Cu), and occasionally exceeds the permissible content (Fig. 2.B). Particularly, noteworthy is a content of manganese (Mn) in river sediments and respectively in the coastal sea water (near the city of Poti). A manganese concentration in several major rivers that wash Chiatura mine sometimes reaches eight admissible norms (Fig.2.D). Although, here we must note, that the recent situation of water pollution by manganese has seriously improved. It should be noted that most of these lands (Rioni River basin area) are irrigated by the waters of rivers, which are used for grazing and drinking water for pets. These results, in many cases certainly cause concerns. Natural radiation also poses a serious danger to the geo-ecological situation. Natural radiation is closely related to the presence of nuclides in Uranium (U), Radium (Ra), Thoriun (Th) and Potassium (K). In West Georgia there are natural radiation anomalies, which had been studied only for military purposes during the Soviet era. 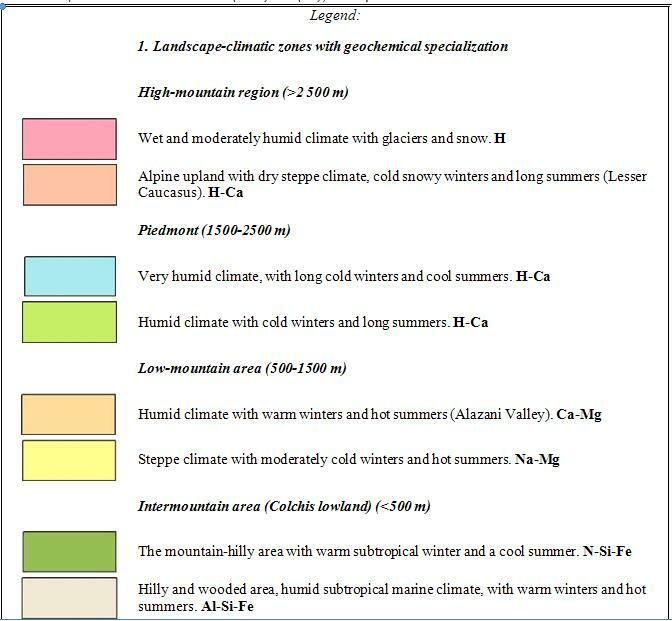 These anomalies are mainly found in areas near settlements and as we have learned, are associated with Paleozoic and Jurassic granitic rocks, Lower Jurassic shale’s, with phonolites of Cenozoic era and Mid-Jurassic coal veins and some other breeds. Typically, the background radiation in these rocks varies from 22 to 30 microroentgen per hour (μR/h). The scientists have pointed out one more serious problem – after the Chernobyl disaster in 1986, technogenic radioactivity was detected in some areas. Radiometric measurements taken in 1987-1989 demonstrated that after the Chernobyl disaster, most noticeably, the western part of Georgia was polluted by radioactive nuclides. In some parts of the Black Sea coast, the pollution reached 30-60 μR/h and in some other areas the pollution reached 90-225 μR/h, whereas the Maximum Allowance Concentration (MAC) for the radioactive pollutants is 10-12 μR/h. 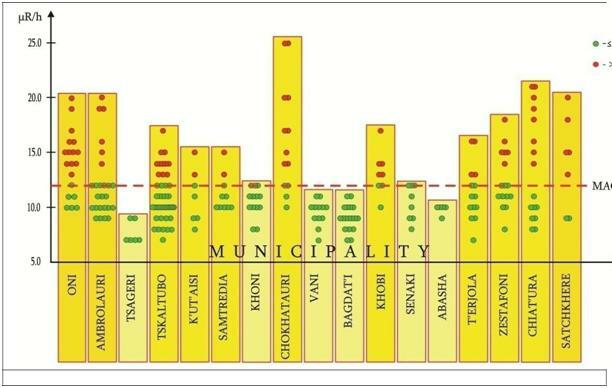 Our measurements in all the municipalities of West Georgia, which are shown in Fig. 3, indicates that these territories today are less polluted by radionuclide’s, but still need continuous ecological monitoring. It also should be noted that in all the places that we have observed, the higher rates of background radiation is in the bushes of tea and eucalyptus trees. Obviously, these plants are characterized by excellent accumulation of radionuclides. Despite the above listed negative ecological phenomena, there is ecological stability in the West Georgian territories. The ecological situation in Chiatura and Zestaponi can be taken as an example. The ecological stability in these areas can be explained by the fact that mining activity in Chiatura manganese deposits has decreased, and this has had a positive impact also in Zestaponi mining factory areas as well. Another noteworthy positive change is an ecologic progress in agriculture. Reducing chemicals and using organic fertilizers had a significant positive impact on agriculture in terms of harvest collecting and ecological quality of the crops. To conclude, we can state that the West Georgian territory is ecologically stable with a relatively normal purity index. But for final conclusions, a geo-ecological research requires constant study in the mentioned regions. In this, we find it convenient to carry out the Geo-ecological monitoring of this area of Georgia. After analyzing all the data and existing early maps (2, 3, 4, 6), we were able to create a geo-ecological map of West Georgia in a scale of 1:500000, on which the current situation of natural and technogenic pollution of this region of West Georgia is shown (fig. 4). The map shows activities that are rated with high scores, and that have caused changes in the landscape. The eco-abnormal areas indicated on the map are local in nature and can be easily eliminated off. A particular emphasis should be made on fresh surface and ground waters that are genuinely priceless for Georgia. If we take other countries experience into consideration, in our opinion, it is vital to tighten ecological standards (8) for water quality. Fig. 4. Geo-Environmental map of the Territory of Colchis and Rioni River basin area (West Georgia). Scale 1:500 000. Nickel. Cobalt. 1997. Directory. “Geoinformak”, Moscow (in Russian). Davitaia F. 1970. Landscape map of Georgia. Tbilisi “Mecniereba”. Kvinikadze M., Kuparadze D., Kirakosian V., R.Eristavi. 2005. The integrated geo-ecological evolu-tion the territory of the Georgia («Eurasia Atlas»). – In Magazine “Caucasus Environment”, # 2(11), 2005, p.37-39. Kvinikadze M., Kuparadze D., Kerestedjan T., Sirbiladze I. 2006. 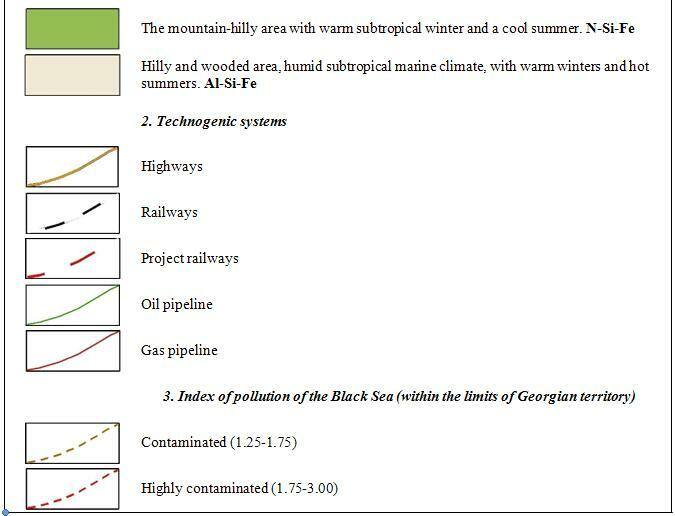 Geoecological assessment of the en-vironment: An example from the territory of Georgia. Bulgarian Academy of Sciences. 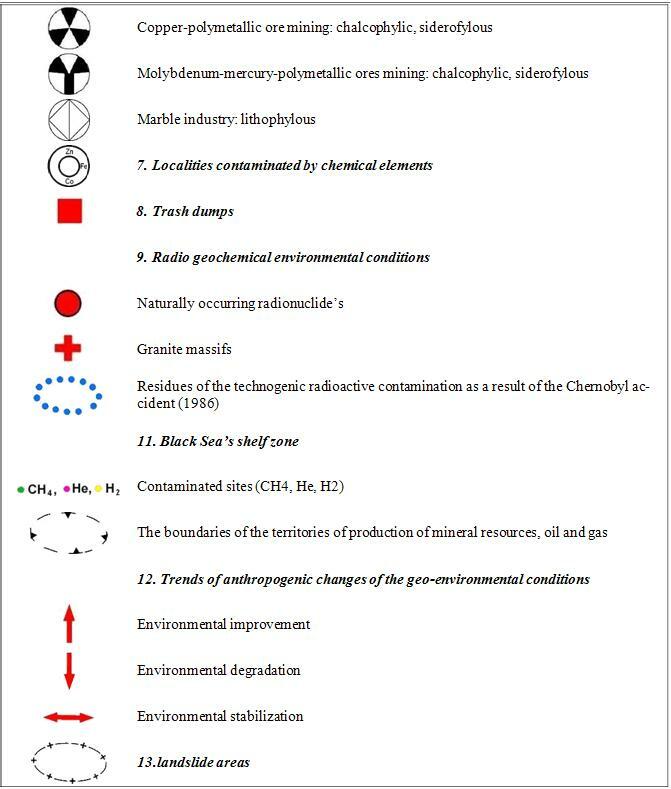 Geochemistry, Min-eralogy and Petrology. #44, Sofia. P.131-140. Kvinikadze M., Kuparadze D., Pataridze D. 2007. 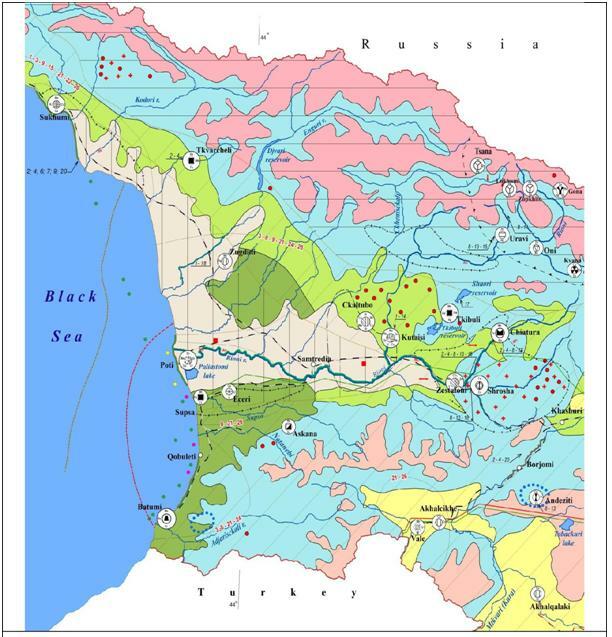 About an ecological condition of Black Sea coast of Georgia. In Magazine “Caucasus Environment”, VII. P.35-43. Seismic Maps of Georgia. 1999. Reports of the Geophys. Inst., Georgian Acad. Sci., 3-27 (in Geor-gian). 2001. Inspection of quality and ecologi-cal safety according to International Standards. Hand-book by G.Fomin and A.Fomin. Moscow (in Russian). 2000. Inspection of chemical, bacteri-ological and radiation safety according to International Standards. Encyclopedical Handbook by G.S. Fomin. Miscow (in Russian). Uncontrolled activity by humans towards nature is endangering not only nature, but human existence as well. Industrial development has introduced a number of negative impacts along with the positive ones. Sadly, West Georgia is not an exception in terms of ecological pollution. The study represents the results of an extended study of the main geo-ecological components of the environment. The study combines direct investigations and an exhausting review of the existing geological information. As a result it could be said that content of heavy metals (Cu, Pb, Zn, Ni, Co) in sea, in rivers and bottom sediments as well as in various soils and bio-samples has selective character. Their anomalous values are pre-conditioned by technogenic reasons (fertilizer application, transport efflux); in comparison to radiation basis accepted in Georgia, radiation values measured by ourselves are slightly higher in some samples of West Georgia (including in clay soils of Batumi, Green Cape and Poti); Manganese and Arsenic content in soils around Rioni river inflow, bottom sediments and bio-samples are much higher than basic values. The results of researches are represented as a Geo-ecological map of West Georgia with their respective explanatory notes.